The first photo appears to be the same image used on the postcard I posted recently and I will refer to it here as the PC photo. 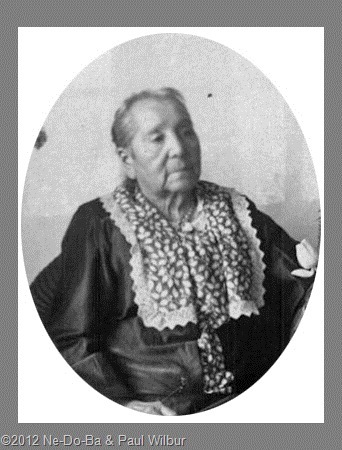 Based on her physical appearance, I believe the picture I have of Lee-o-netto and Charles Dodge was taken at approximately the same time in her life. I will refer to this second photo as the Dodge photo. Here are the two faces side by side for comparison. She appears free from the winkles and sag of age in both images. If anything, perhaps a bit older in the PC photo. If I can date one of the photos, I should have an approximate date for the other. Let’s start with what I know. Lee-o-netto and Charles Dodge where married in 1888. It would be extremely unusually to find a man and woman photographed together unless they were husband and wife or brother and sister. Therefore 1888 is where I should start. I know the postcard was printed no later than 1906, so I don’t need to go past that year. I do not have any original photos in my procession, only scans and photos of photos. This puts me at a disadvantage because I can not examine the paper they are printed on, measure the thickness, look for a color cast, etc.. If I had this information it might help to provide a time period. I was able to gain some clues from the Dodge photo because Randy also provided a photo of the back allowing me to determine it is a photo with a card backing. I can not measure it, so I am not sure if it is a cabinet card or cartes de visite (CDV). The cabinet card came into popularity in the 1870s and had almost completely replaced the CDV by the 1880s, so my best guess would be it must be a cabinet card. Since cabinets cards went out of fashion around the turn of the century, this fits well with the 1888 to 1906 time period. In fact I think I can safely adjust the time period down to 1900. The card is light colored on both sides and has rounded corners with a photographers imprint on the back. There is no preprinted border around the photo that I can detect. The bottom edge appears to be cut of, perhaps to make it fit in the frame provided in the Bible Stories book where it was found. The photographer’s imprint is large, ornate, and covers the entire back. This practice began in the 1880s. The photographers studio imprint is for “W. Martin, Salamanca, N.Y.”. I am not having any luck finding directories for Salamanca in the 1888 to 1900 time period. I will keep looking for information about the photographer. He is not to be found in census records for Salamanca. The closest I came was a William in the almshouse in 1910, but his occupation was blacksmith and a W. A. Martin at Olean, but he was a general laborer in the 1892 NY Census. 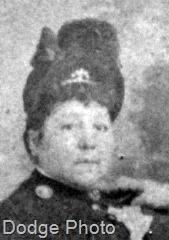 The only possible Martin in Salamanca is an Adam W Martin, a letter carrier from 1910 on who I did not find in 1900 or 1892 census. It appears this is not going to help me. The photo at the top of the page also appears to be a photo pasted to a cardboard backing. It may be a variation of the cabinet card format. A characteristic that stands out is the scalloped edges just barely seen on the right edge. This was common beginning in the 1890s. A very obvious characteristic is the embossed faux frame surrounding the picture. This practice began in the 1890s, being more common after 1900. So far I still have this rather large ballpark date of 1888 to 1900 for the Dodge photo. Ah, but look at all the details in the clothing and accessories. I should be able to find items useful in dating the photo. The pose is very unusual. In 99.9% of vintage photos, the man is seated and the woman is standing by his side. In the Dodge photo, Lee-o-netto is seated and Charles is standing by her side. I wonder if this was a choice made by the couple or the pose preferred by the photographer? My research suggests the pose might have been a fad for a very short period of time. I looked at hundreds of photos of couples and found only four where the woman was seated, one dated 1883, two dated 1888, and one dated 1889. 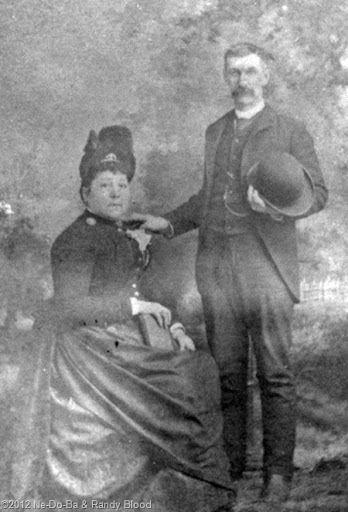 The lady and gentleman in one of the 1888 photos are dressed in almost identical attire to Nettie & Charles! My first impression of the Dodge photo was “I bet this is a wedding photo.” Hmm, married in 1888, and my photo sleuthing suggests a date of late 1880s to early 1890s. It appears I could be right. The other photo is probably no more than 10 years later based on no change to her hair-style. This PC photo was probably taken somewhere between 1888 and 1900, but appears to have been reproduced a number of times in a number of formats well into the 1900s. 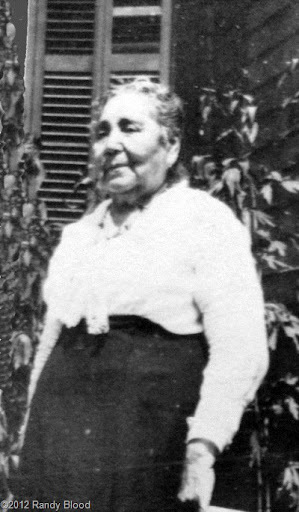 Just as a point of reference, Lee-o-netto was 44 years old when she married Charles in 1888 and would have been 56 years old in 1900. These last two photos are obviously from a much later time period but I have no specific dates. The clothing styles for older women are not well documented in the various dating resources I found in print and online making it difficult to come to any conclusion. My hunch is they are both from the 1930s, but I could be very wrong. Image 3 is a snapshot, while image 4 is clearly posed and probably taken by a professional photographer. I think she appears older in image 3 but it could be just the difference between formal and informal photography. to Randy, Paul and all the other descendants of Carrie Kanistanaux Horton involved in preserving and sharing their wonderful family treasures. 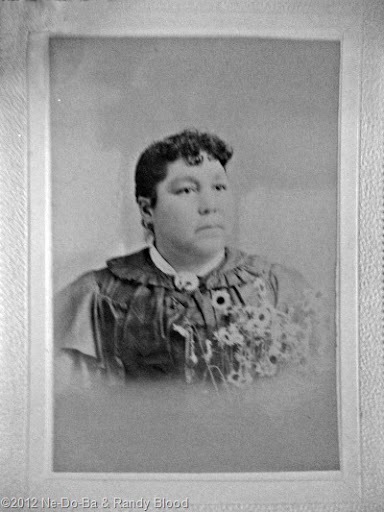 Flickr has a “100 years old” and a “Cabinet Card” group that I found useful. Also, be sure to check out all the links found on the 1st two sites because they will take you to dozens of other great resources.